Doctor Who: Revisiting JOURNEY TO THE CENTRE OF THE TARDIS | Warped Factor - Words in the Key of Geek. Dr. Moo presses the Big Friendly Button. So now we come to one of the weirdest stories Doctor Who has ever told, which is saying something: Journey to the Centre of the TARDIS basically does what it says on the tin and feels like the kind of story where the title came first and the plot came second. After its original 2013 broadcast this episode proved to be a divisive one – how well has it held up 3 years down the line? What are these issues that hold it back in the minds of so many? For starters you’ve got the trick being played on Tricky by his colleagues/brothers Gregor and Bram. 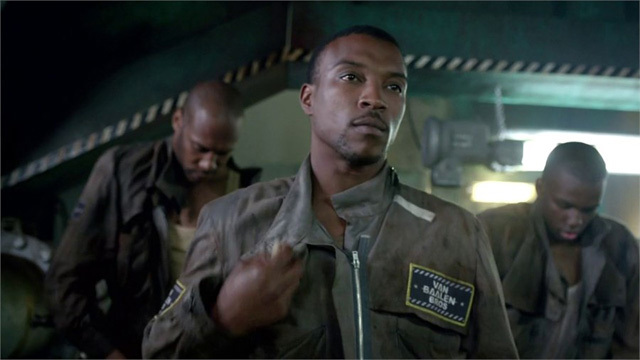 These three are, besides the 11th Doctor and Clara (and I think this is one of those times when the TARDIS also qualifies? ), the only characters in this story so writer Stephen Thompson has to get them right… but he doesn’t. Tricky has had, prior to this story, an accident of some kind and now he’s recovered from it the other two have somehow convinced him that he’s only survived because he’s an android. They then proceed to treat him like crap because of it. Look at our likable supporting cast everyone! Oh, and this subplot doesn’t even go anywhere. It adds nothing to the story whatsoever and I can’t see any reason why it was included. Then there’s the way the TARDIS acts throughout the first half of the story - malfunctioning, starting to go crazy and lashing out. At one point it throws spiky bits of metal at people through the wall, it creates several duplicates of the console room, it loops corridors back on themselves… it’s all a bit weird. 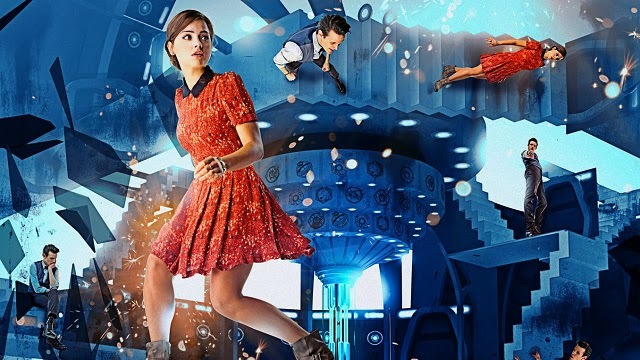 This is all going on as the Doctor, Gregor, Bram and Tricky are looking for Clara who is stranded inside, meanwhile she is simply wandering around aimlessly (it's as if Thompson forgot that Clara knows her way around the TARDIS) and ends up exploring various locations such as the swimming pool and the library – the latter features a book The History Of The Time War which contains the Doctor’s name, which makes no sense that it should exist in printed form. Like I said: This story is weird. I haven’t even mentioned the sheer stupidity of the technology tree or the laziness of the deus ex machina Big Friendly Button ending. And then there are the Time Zombies. These creatures are walking husks of burnt humanoids and are actually very creepy thanks to director Mat King’s camera work. He keeps them just out of shot or partially hidden to add to the creepy factor, with Clara being pursued by one making for some tense moments… but once you learn what they are they cease to work as a credible threat. These are what the characters become after exposure to the Eye Of Harmony (Why’s that in the TARDIS now? Please can someone explain?) burns them all up. It should be a scary idea, and the actual burning effect when we see it happen to two of the salvagers is certainly impressive, but overall it falls flat and fails to send the kids behind the sofa in the way that it could with a superior writer dealing with it. Other than the Doctor and Clara, we don’t find ourselves able to like these people so when they become Time Zombies we just do not care. Not at all. Not in the slightest. 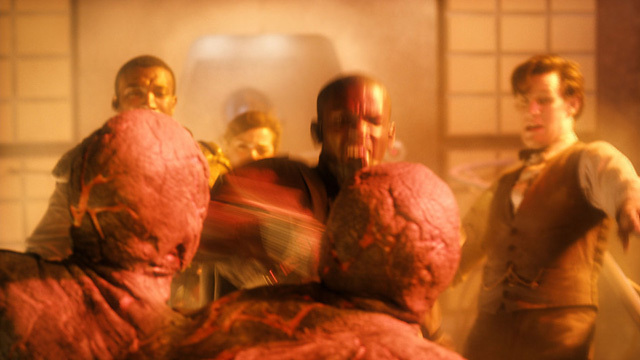 They transform and then the Doctor and Clara escape and that’s it. So not only do we not care, we also don’t need to worry about them because we won’t see them again. So what was the point of having them be there? With all these problems you’d be forgiven for thinking that I don’t like this episode, but that’s not true. I actually like it quite a bit and that’s because of the 11th Doctor. Matt Smith is always brilliant (but you have seen him acting so obviously you didn’t need me to say that) but he does something quite different here. While 11’s usual levels of infectious energy are on display he is more subdued this time, reining in his performance and being more subtle. The Doctor has lost Clara and she’s in mortal peril – this is serious and there’s no time for games. He needs to save her and he needs to save her fast. While the way he creates a fake auto-destruct countdown is a bit silly it gives his collaborators (the trio of salvagers) a sense of urgency to help him find her, so it’s exactly what the Doctor would do to get to her as quick as possible without messing around. There are other great moments from Smith as well, with his condemning words after Tricky’s deception into thinking he’s an android is proved to be just that being one of those great Doctor moments. Then there are his interactions with Clara. The scene when he tries to tell her about her other selves from Asylum of the Daleks and The Snowmen or the scenes when he’s reaching out to her in the console room’s echo and he has to save her are both brilliantly done, but the final scene “two days crammed into the space of one” is the best bit, a delightfully understated moment that ends the story on a high. Smith however shares the screen here with Jenna Coleman (or Jenna-Louise Coleman as she’s still inexplicably credited at this point despite nobody calling her that) and she’s just as good. This is still the personality-lacking Clara of series seven but that never stopped Coleman from delivering the goods and sure enough she does it again here. The fear Clara has as she runs from the Time Zombie is believable, and her inquisitive nature as she explores the many rooms of the inner TARDIS is done well with barely a word spoken. As well as the brilliance of Matt and Jenna there’s the look that the story has. 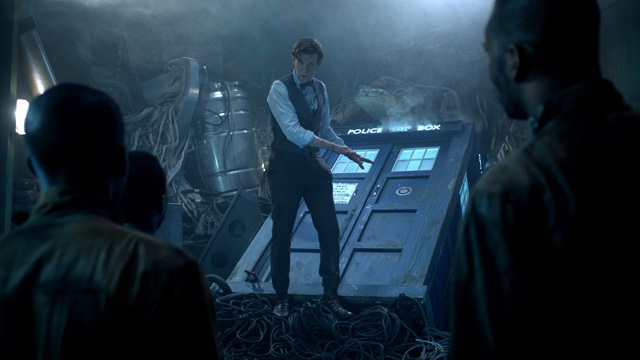 It may be a very weird and nonsensical tale but it’s still beautiful to watch with the claustrophobic TARDIS corridors or what little we see of the salvage ship being utilised well. 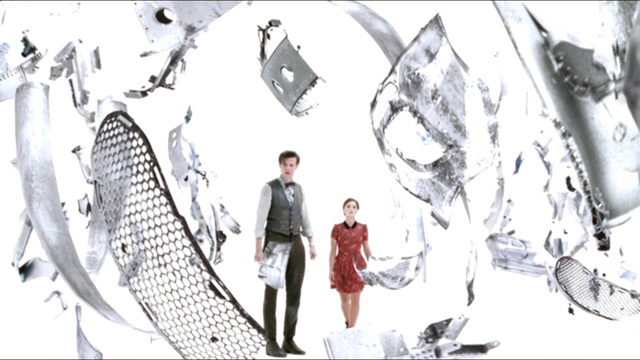 When we see the Eye Of Harmony the effects used to create it make it look like a real thing, and the Heart Of The TARDIS with its big white emptiness and various items floating freely in the air create a great atmosphere. Overall then, Journey to the Centre of the TARDIS is certainly not worth watching for a coherent plot or good one-off characters because that’s not what you’ll find. What you’ll find instead is a story that looks great and has the two leads on top form. It's not worthy of Matt and Jenna but together they just about salvage it.